I had been experiencing Braxton Hicks contractions for weeks before going into labor. I was expecting to go into labor early since Big Sister was born at 36 weeks, and Bella at 38 weeks. However, our little guy had a different plan. I was as big as I ever. I had always wished with my previous pregnancies for a large pregnant tummy. Well, be careful what you wish for..it came true. We had some family portraits taken a few weeks ago and I also had some maternity photos taken to celebrate this pregnancy. Over the last few weeks, I was feeling very excited and anxious for his arrival. I had contractions about 10 minutes apart the day previously, they continued all day long but they did not get closer together or any more intense. The next day I didn’t have the contractions start until late in the afternoon. My mom picked up Big Sister and planned on keeping her for the night. My husband and I spent the evening eating dinner my mom brought over and talking about the upcoming birth. I had a few contractions that started while we were making dinner, I took a bath and the contractions continued. We decided to time them and they were about 6 minutes apart, though not very intense. I went to the couch and we were watching TV when my water broke at 8:30. It caught me by surprise, I let out a scream. My husband was startled and we started laughing about the amount of water that was now all over the couch. We called our midwife, Lisa Coomer and she said she’d be heading over. We continued to watch TV and realized my contractions stopped and I was feeling fine. We called Lisa back and told her not to hurry that I might not be in labor yet. She said she’d head over anyway just in case and get set up. Well, I vomited up my dinner and started to have a few contractions, but they were still very mild. Lisa arrived and so did my contractions, this was around 9:30! I’m very glad she had the intuition to head right over. I guess the very presence of Lisa made my body feel like it could finish its work now. I tried to relax on the couch and breath through the contractions. They were now very intense and caught me off guard. They didn’t build in intensity, they just became instantly intense. My husband was my strength through the contractions, he sat close, held my hand and I focused on his eyes through the contractions. He was awesome. Lisa checked my cervix and I was 4cms at that point. I found that quite discouraging and thought how will I continued with this intensity of contractions if I have to be in labor for another 5-10 hours! I went through 2-3 more contractions and Lisa checked again, I had progressed to 8 cms! My mother had arrived with Big Sister somewhere around this point. They also started drawing the bath water. I went through a few other contractions and made my way to the bathtub. With one foot in the tub and one foot straddled over the edge onto the floor, I had a contraction that was now feeling like I needed to push. Lisa is telling me to not push until I’m in the water and told my husband to get his swimsuit on right away! Once I entered the water it really felt a lot better. I started pushing right away. My brain gets foggy at this point and I seem unable to remember how to push. Lisa gives me instructions and keeps reminding me to keep my chin down. My husband kept whispering supportive words in my ears also reminding me to keep my chin down, he’d also give a gentle push to push my head forward which was very helpful. He tells me at some point Lisa had me touch the babies’ head as he was coming out and I said, “oh, my little guy!” I didn’t have many breaks, it was pretty constant pushing for the next 20 minutes. My umbilical cord was rather short and wrapped around his arm so I pushed extra hard at the end to get him out. He was lifted from the water placed on my chest and he was very calm. We rubbed his feet and he started crying. He had so much hair and he was so beautiful!! Grandma and sister were crying and mom and dad were staring in amazement at our beautiful little baby boy. We moved carefully from the bathtub to the couch where big sister cut the cord and our little man had his first nursing session. Our friend Mandy arrived just in time to take a lot of pictures and share a glass of champagne. 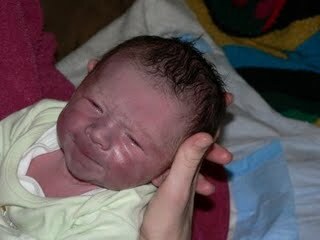 He was born at 10:49 on January 13th. He weighed 8 lbs and was 22 inches long. He was such a big boy and I didn’t even have a tear, I was so excited. It’s a week later now and I can’t take my eyes off of him. He has such a beautiful color (thank you daddy!) and is a very peaceful content little guy. We all spent the first night together snuggled in the living room. I didn’t sleep the first night, I really spent the first night staring at my family and feeling so blessed and thankful. Our first week went by so quickly we were all together as a family snuggling and loving, it has been wonderful! !